Not all of us can make time for exercise – those moms and dads who jump out of bed in the morning and run five miles? Yeah, we hate them too. But the ability to multi-task helps. A jogging stroller provides this – parent and pound the pavement all at once! 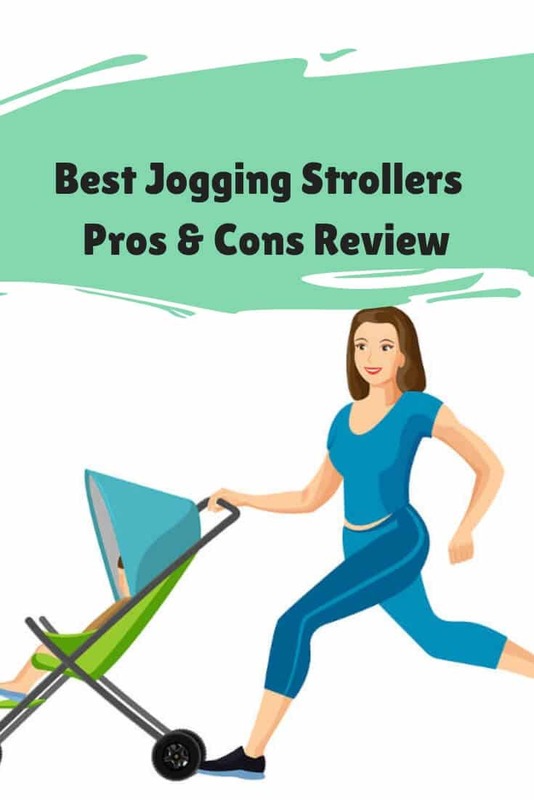 Why Buy a Jogging Stroller – Is a Jogging Stroller Worth It? Sure, you can technically jog with any old stroller. Heck, you can jog with your child in your arms and get one heck of a bicep workout too. Purchasing a jogging stroller, however, offers several advantages. 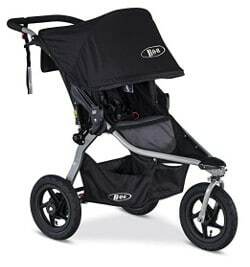 First comes safety – regular strollers are not made to be used when running. 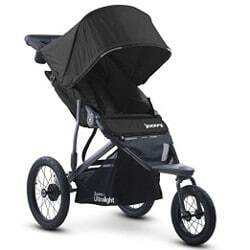 Jogging strollers, on the other hand, are designed to keep your baby safe as you jog along the road. Of course, the jogging itself is also beneficial. 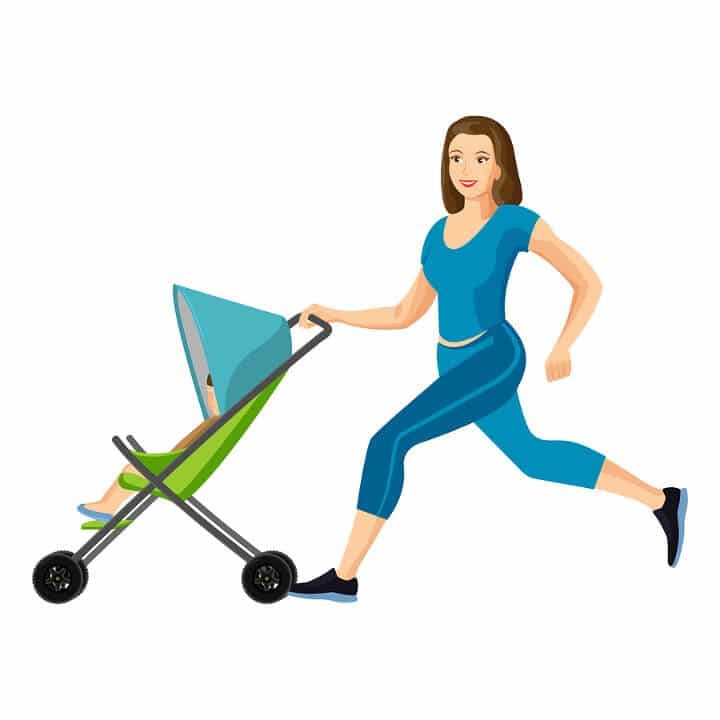 It’s not exactly groundbreaking news to say that exercise is good for us, but jogging strollers add a “no excuses” element. You can work out with your child in tow. Jogging strollers also allow you to jog on a variety of terrains – you don’t need to stick to the boring old sidewalk. Take it on a dirt trail or up a foothill. It’s designed to provide a smooth ride even when the ground grows rocky. These strollers, despite their name, don’t have to be limited to people who jog. Take one with you to anywhere with rough terrain (a jogging stroller can handle it), to the dog park, to the amusement park, or to the local flea market. Another reason to use a jogging stroller is because you’re one cool cat and deserve something stylish. Stay hip, fresh, and fit with a sporty look. Jogging strollers allow you to maintain your active life – don’t let your child cramp your awesome style! This stroller offers easy mobility with a locking swivel-front wheel. It also comes with mountain-bike like suspension and adjustable handlebars. Do you want to get out and get moving? Good news – it’s travel system ready. Grab your things and go, go, go. What parents like: The weight capacity is generous; it holds up to seventy-five pounds. Do you want to punish your nine-year-old for talking back? Jog around with them in a stroller! Other benefits include a straight back in the seat, the ample storage room, a one-handed seat recline, and a large canopy. What parents don’t like: The depth of the seat is a bit shallow and the seat height is lower than some parents like. This allows you to carry older kids, but they won’t have as much room as some parents (and some kids) prefer. The parent console is also a must-have, but it’s not included. This stroller features a parent tray with cup holders and a covered compartment for storage. The footrest reflectors are ideal for parents who jog at night or very early in the morning. And the stroller is extra-wide, giving kids all kinds of legroom (not to mention head and arm room). The pros include easy assembly and a stroller that is lightweight. It’s easy to use on rough terrain and it provides a smooth ride for the child as well as an effortless push for the parent. The sunshade is effective and able to adjust to various angles. The cons include the tires: they tend to lose air fast. If you have an air compressor in your garage, this might not be a big deal, but if you don’t, it can be annoying – there’s not roadside assistance in the stroller world. The harness is another con – the straps are stiff and difficult to adjust. They may also cause rubbing on your child’s neck. This is fixable with extra padding, but a con, nonetheless. The features of this stroller include easy mobility and great suspension. It also has a handbrake for downhill maneuvering and adjustable handlebars. The weight limit is liberal (up to 75 pounds and 44 inches) and it comes travel system ready. Parents like that this stroller has such a large canopy and brakes that work extremely well. The upright seat back, single release strap mechanism, and safer wheel fork holes are also perks. Parents don’t like that the canopy doesn’t stay in place – hitting a bump is enough to knock it up a notch. The stroller is also bulky and heavy, making it difficult to lift and store. It may be difficult to load into your car without assistance. This stroller features a locking swivel-front wheel and twelve inch wheels with superior suspension for a smooth ride. It also has a no-rethread harness and one-handed recline. It’s travel system ready and has a one-step foot-activated parking break (for when your traveling is complete). Parents gush about assembly – you don’t need to have a BA in engineering to assemble the stroller. It’s also easy to collapse and store. The lightweight frame makes it effortless to tote. And the wheels make it easy to push, no matter what type of terrain you’re on. This stroller allows you to go with the flow…and the roll. Parents don’t adore that it lacks the pockets to store the 582 items kids must travel with (for many parents, pockets aren’t optional). And it’s not the most ideal stroller for people who are tall – the handlebars are not adjustable. This stroller features extra wide, high seats that give your child a chance to see the world around them. It also comes with a parent organizer and tire pump. It’s easy to clean too……magic words to mom and dad. The perks include the ride: kids enjoy it! It’s easy to push, even when you’re pushing heavier children. And you can take it on a variety of terrain. There’s plenty of legroom and the seat sits tall enough that you can use it as a chair for mealtime. The cons include foldability – it’s not easy to fold. The seat does not recline all the way and reclines less the taller your child gets. It is large and not easily pushed through tight spaces. And the canopy may touch the head of taller children. Some kids might not care about this; others will. This stroller is a pushover – it’s easy to move and lock in place. It’s ideal for hilly terrain with a handbrake. The handlebars are adjustable and ergonomic – jog without the backache! Parents like that this stroller is easy to assemble and good-looking (people describe it as gorgeous). It offers a smooth, easy ride with solid head coverage via the canopy. Kids enjoy riding inside as much as parents enjoy pushing outside. Parents don’t like that it’s difficult to fold (though you can fold it easier on the ground). It’s quite bulky and the seat is hard to adjust when the child is inside. This stroller comes with a lightweight frame. It’s easy to push with spring-shock suspension that provides a smooth ride. Tires easily grip the road and the ball bearings help reduce rolling resistance. It comes with a bicycle-style hand brake, making it easy to slow down and stop. The benefits include its weight – it’s easier to carry and store than bulkier strollers. The padding is also very comfortable, offering a nice, enjoyable ride for Junior. It’s easily steered and the tires hold air well. The cup holder is a helpful addition, too. The bad news includes the sun visor – it doesn’t go down far enough to be effective. The stroller is difficult to load once it’s folded (it does not have a handle). You also can’t unfold or fold the stroller with one hand. This stroller adapts with all Chicco Key Fit and Key Fit 30 infant car seats. It offers one hand standing fold, flat trunk fold, and quick release wheels. You can also adjust the suspension to control for the terrain. It features no-maintenance never-flat tire technology too – save your air compressor for the pool raft! Parents like the feel of this stroller – it’s safe, sturdy, and smooth. It also has ample seating, adjustable handlebars, and a seat that is easy to recline. The brake and wheel controls are at the handles, another perk. And the storage is big enough to carry the obligatory diaper bag all parents have. Negatives include a cup holder that is flimsy and front wheels that make for an odd appearance. Some parents would also like a tray in the front for the child seat. Exercise is one of those things many parents have no time for – why run down the street when you can run to your bed? But a jogging stroller benefits you and your kiddo too. The above are good options, allowing you to feel the burn without the hassle.